This is the third article in my series on foot massage tools, this time focusing on massage sticks and rollers. Similar to how tennis balls and other types of balls can be used to aid in foot massage, these tools tend to be simple, inexpensive, and easy to transport. To use this type of massage tool you can simply sit in a chair (or you could stand) and roll your foot back and forth over it. In some situations, though, it may help to hold the stick or roller and manually roll it back and forth over the bottom of your foot. Previous posts have already discussed two other types of foot massage tools: Electric Foot Massagers and Plantar Fasciitis – Are They Helpful, which also provided information regarding cautions and overall benefits of using massage tools in general, and Anyone Can Do This! Foot Massage with a Ball. Rolling tools come in various shapes and sizes. Most simple rollers are made out of plastic, foam, wood, PVC, or bamboo. Many are in the form of a simple bar or stick, 1-2 inches in diameter, with raised, flexible surfaces or “ribs” that stretch and knead muscles to promote sensory stimulation. Larger versions, typically described as foam rollers, can be as thick as six inches in diameter but these are not generally used for massaging feet. There are also “multi-roller” structures, constructed as a flat or slightly convex curved surface with multiple rows of small, individual rollers, each row holding 2-4 of the small rollers. This type of structure allows you to roll your foot over the top of the structure, engaging your foot with numerous rollers rather than struggling to keep one smaller roller tool under your foot. These multi-rollers have as many as 40 rollers total, each roller having its own “bumps” to stimulate your feet. The “bumps” on rollers or “ribs” on massage sticks are typically small protrusions or indentations that, combined with a rolling action, provide more impactful stimulation for muscles and tissues in your foot. As noted previously, they stimulate circulation, helping to soothe and massage tired, aching feet. Certainly these no-cost objects aren’t as elegant as a well-crafted roller manufactured with foot massage in mind, however, the price is the best you can get! Just be a bit careful at first. If you already have a problem such as plantar fasciitis, some of these objects, the ones with sharp edges or prickly constitution, may be a bit rough based on your tolerance level for pain. One other no-cost roller comes to mind: a plastic water bottle filled with warm or room-temperature water or frozen to provide both an icing effect along with a massage. You can read about the benefits of water bottles in the article entitled Practical Water Bottle Massage Therapy for Plantar Fasciitis. No external power source required! Are there disadvantages compared to electric foot massagers? Yes, there are. Number one, you have to move your legs continuously to get the massage. There simply is no massage if you stop moving your legs and feet. Another disadvantage is that massage sticks and rollers cannot provide some of the functions that electric massagers may provide such as hydrotherapy (water therapy), heat, and/or the ability to massage multiple parts of your foot at one time. Obviously, rollers cannot duplicate these features. What about comparing massage rollers to massage balls? When you consider their purpose, they seem very similar. Do rollers provide more or less relief than a ball when it comes to massaging your feet? Well, first of all it depends on which massage ball and which rolling tool you compare. There are so many of each of these types of tools on the market and they vary in what they have to offer. Based on the opinions of numerous trainers, doctors, and therapists who have posted on the internet, along with many comments from those suffering with plantar fasciitis, the answer to this question is that it probably is a toss-up. There has been one thing that appears to stand out when researching this comparison. It is that the bottom of your foot appears to be stimulated more by something with ribs or bumps (ball or roller) that can dig into smaller spots and that can help focus on specific sore spots or trigger points. Not all rollers or balls can do that. The following video by James Tatum describes the use of one very simple type of massage roller. Want to make your own foot massage roller? If you own a lathe or know someone who does, it apparently isn’t all that hard to make a wooden massage roller using a chisel. The next video, by Peter Brown, gives a quick three and a half minute view of how it can be done. In most cases, foot massage rollers are used to assist with sport massage and general relief of tight, sore muscles. The texture (bumps) can aid in myofascial release, a process that allows muscles and tissues to relax, thus promoting pain relief and elimination of soreness. Some rolling tools are made in such a way that they can also assist you in performing self-massage such as deep tissue and trigger point massage. For example, if created for such a purpose, the end of a rolling device could be utilized to place pressure on a specific trigger point. With regard to trigger points and reflexology, one product description noted that you do not have to believe in reflexology or even know what it is to enjoy the relaxation provided through use of the device. The description stated that using any rolling device will typically leave you with a tingling feeling in your feet. But can these simple devices actually help eliminate plantar fasciitis? According to the website Beyond Talk, rolling devices are “especially useful if you are experiencing sore feet or conditions like Plantar Fasciitis.” The opinion is based on the idea that this type of massage tool can aid in myofascial release. Perhaps it is best to say that these tools can most likely aid in relief of some portion of plantar fasciitis pain. Since everyone is different, however, it is impossible to say that any one specific type of massage treatment will definitely eliminate a problem such as plantar fasciitis. So many tools that can be used to aid in massage! And so little scientific study to test whether massage can actually aid in the healing of plantar fasciitis or the elimination of heel pain. How can we know? What we do have is a multitude of foot specialists, trainers, and doctors who swear that deep tissue massage has helped many of their patients who have come in with this type of problem. Plus, we can read many comments from those suffering with heel pain that confirms that massage has helped relieve at least a good portion of the pain. How about you? Any testimonials of massage to share? Or, have you tried massage only to have it fail to provide any type of relief? I would love to hear from you. Allyn Beekman has worked in the computer industry and higher education. At a point of semi-retirement, he struggles with plantar fasciitis. His goal is to share all avenues of treatment and exercise that will help eliminate heel pain. Electric Foot Massagers and Plantar Fasciitis – Are They Helpful? I’ve been dealing with plantar fasciitis off and on over the past 5 years. The first time it started it felt like someone was sticking a nail through the bottom of my foot. As described on your website, the foot massage sticks and rollers was something I used multiple times everyday on the road to recovery. Thanks for the great information on the massage tools! Hi Brandon. It’s nice to hear from someone else who has used this type of tool. I’m glad that the massage rollers were helpful to you. Was there any one particular model of roller or massage stick that worked best for you? Pain is a sensory-affective signal threat, or damage to the body. A man can learn to live with, but can also search for the cause. and it take up most of the space, which is defined for needed rest , the body protesting with tendons problems. The Healing Power of Illness: Understanding What Your Symptoms Are Telling You by RÃ¼diger Dahlke, Thorwald Dethlefsen. I hope that my advice was useful for you. Good luck. Thanks Jana. I’ll take a look at that resource. I haven’t heard of it previously. I could say that foot massage is necessary for our health as all of our body organs are connected to the feet. By pushing different places of the foot, the equivalent organs relax and get better. I mostly use a water bottle to do this, but foot massage sticks seem to be doing much better work. Great article. I love foot massage and massages in general. Thanks for the information! Thanks for your comment, Effie. I’ve seen a few comments on other sites where individuals talk about using a water bottle, especially using warm or hot water to help relax their feet. Most water bottles I’ve encountered are pretty smooth, however, so they don’t “push” a lot on any particular spot. Massage sticks are designed specifically to do just that so they would probably do a better job of stimulating the specific spots on your feet. Or, like I mentioned, you could go “natural” and use a stick or pine cone but that seems like it might hurt a bit! I’ve been experiencing foot pain lately. I think getting something like this would help me out. Something you mentioned for a no-cost massage roller is a pine cone. This seems very uncomfortable. I guess I just have sensitive feet though. I’ve never even tried the baseball thing for massaging the foot. I should probably look into some of these ideas since it hurts to walk around sometimes. Hi Gina. I expect the pine cone would be very uncomfortable, yes. My feet are very sensitive also. The pine cone and rough boards were mentioned to show that there are many “free” tools out there but I certainly wouldn’t choose them first. I use balls quite a bit myself when I’m just sitting at my desk. If I haven’t rolled my foot on a ball for a number of days I can really feel it work out some of the sore spots when I first start using it. I prefer a baseball or even a smaller, harder rubber ball. Then there are the electric foot massagers, too, like the UComfy Shiatsu Foot Massager. If your pain is mostly from foot fatigue, that could be a very nice Christmas present for yourself. My son in law has this affliction and he hobbles around like an old man sometimes. This is rather difficult for him because he is a kitchen fitter and tiler and this heel is interfering with his work. At the moment he has been given some sort of boot from the hospital, which he has to put on his left foot regularly and whilst in bed. It’s a bit cumbersome and he didn’t seem sure if it’s working or not. It certainly is a passion killer in bed according to my daughter! He was complaining about the right foot a few weeks ago. I gave my daughter some magnesium chloride solution to put into his drinks. Now both feet seem to be improving. He thinks the left foot is better because of the left boot. Personally, I think its the Mg. He also has to soak his feet in iced water twice a day for half an hour. My daughter is also putting epsom salts (magnesium sulfate) into the water as it will absorb through the skin. Thanks for sharing. You’ve mentioned several things, each of which could be having a positive effect on the plantar fascia. It’s hard to say which might be doing the most good. My site actually addresses almost all of these in one form or another. For example, I wore a night splint for a while also and it did a lot of good for me because it kept my foot in a normal position during the night (and yes, it may kill some passion but so does terrible foot pain!). The ice water is part of common RICE method of treatment. Magnesium and epsom salts can be helpful also. So, your son-in-law is doing good things to help out. Keep that boot on a little longer at night. Keep up the other good things he is doing. And yes, get him some sticks/rollers/balls to use to massage the fascia when he is sitting down. Whatever you can do to get rid of the pain, do it! While I don’t have heel pain now I’ve had it before in the form of heel spurs and they are extremely painful. I’m interested in foot massage sticks and rollers because I have numbness in my feet. I’ve tried so many things for relief and so far no success. These might be the answer. Do you know if they help with foot numbness? Hi Rob. My research indicates that most of the wooden massage rollers do talk about relief from foot numbness. Since I’m not focused so much on numbness as opposed to foot pain I haven’t really delved into this very deeply. 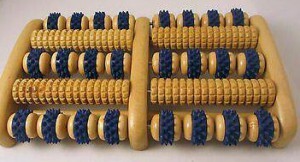 The wooden rollers, particularly those with multiple rows of rollers, are intended to stimulate the entire bottom of the foot. Thus, it makes sense that they could relieve not only pain but also numbness caused by damaged or distressed nerves. Diabetes and Heel Pain – A Link to Plantar Fasciitis?